Back in 1875 the Earl of Shaftesbury and a few other kindly people set up a charity to build 61 shelters around London for the cabbies to have a cuppa somewhere warm and dry. Prior to this cabbies might stop of at the pub for a pint or two. Problem with this, aside from the obvious is that their cab might also be stolen. (we're talking horse and carriage back then). There were a few rules associated with these shelters: no gambling, no alcohol. As they were on public highways, the police decreed that they be no bigger than a horse and carriage. This meant no more than about 10 -12 cabbies could take shelter at any one time. Thus as each new driver arrived the ones before shuffled around to fit him in, the first one leaving to make room. Just enough time to finish your warm cuppa. Brilliant ! Well done for capturing this Mo. Great idea. Great blog. Love your photography. I have a new camera and can't wait to learn all the tricks but now I'm old It takes a long time for me to remember what settings to use etc. 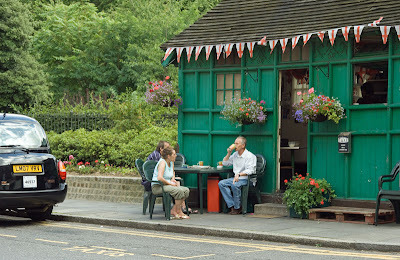 I once followed a guided tour around" Little Venice" in London..... so I heard the story for the first time about these small green shelters. It is so nice to see your photograph! ;-) as well as many other photos in your blog! Our guide said something about that it was forbidden with "spitting and swearing", and the drivers had to wear a tie..... I don´t know if that was true or not. Looks like a cozy place to stop for a tea break! Nice colorful snap - go green! I have been racking my mind where have i seen these tearooms? Please put me out of my misery and tell me! Oh by the way a great picture as always! I love learning all the little things you teach. Thanks for the information and the beautiful picture. Great picture and very good story. This looks so cosy. And of course the cab drivers must have a nice resting place. Ah, at least someone was looking out for them. Glad that they are listed now or I'm sure they'd have been demolished. Those Cabbies Tearooms were so uncivilised, no gambling and no alcohol! Years ago, I heard a programme on the radio about them. Then I forgot - until now. I'm surprised there are any left! Bet if there were new ones for non-drivers, they'd be poplular. I went on a London Walk sometime back and the guide told us a bit about the 'tearooms'. Me being me, I forgot about what he said even before the end of the walk. haha, thanks for the refreshment lesson. I've never heard of these. Great background. I'm loving the photo and that there were people out having a cup. Thanks for the info. I know I can do with a butty anytime! I love the history of this old town! I was driving through East London yesterday and tried to fathom what it would have looked like after the Blitz. If only London's buildings could talk, what story tellers they would be.